I decided to save the best for last. One of my favorite food combinations is watermelon and feta cheese. Although it sounds strange, the sweet and salty pairing always wins. I’m looking at you, bacon and chocolate. 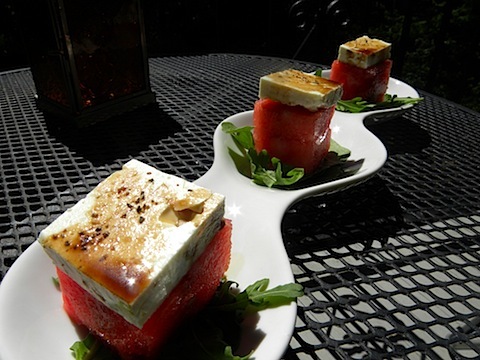 â€¢ After I cubed a few pieces of watermelon I cut slices of feta and drizzled them with the balsamic vinegar. I added a touch of sea salt and fresh black pepper on top. I rested all of the watermelon on small beds of peppery arugula! Yowza! This is a quick and absolutely beautiful dish to create. 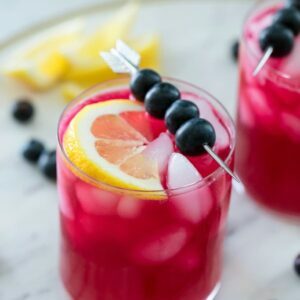 I think the fun thing about it is if you’re entertaining, people will be impressed by its uniqueness… it’s a definite conversation starter ðŸ˜‰ In a few speedy minutes I had a refreshing mid-day snack that I enjoyed with my feet up outside on my deck taking in the final day of July. And what a beautiful one it is. To learn more about Athenos and for more feta inspired recipes, become an Athenos fan on Facebook. 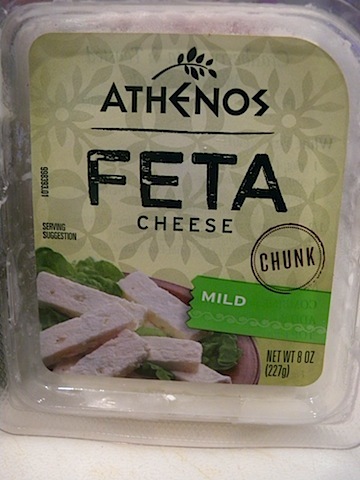 Thank you to Athenos and thank you to our lovely readers for participating so much and offering all of your feta suggestions! 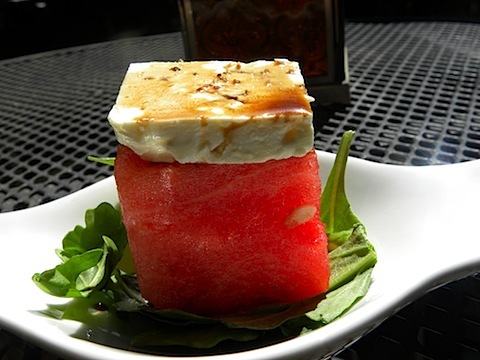 13 Responses to "Watermelon Squares with Feta and Arugula"
WOW! You did an amazing job capturing the beauty of Vlora’s dish, one of my favorites of all time. And yay! I won!!! Love that you re-created Vlora’s dish! I did something similar last week for Bret’s dad’s birthday party! I am seeing a huge watermelon / feta blog world trend! hehe and it’s all thanks to Vlora. I must visit. ðŸ™‚ great job on the challenge this month and here’s to a great August. I just wanted to let you know that some of the links on your Blogs We Love page don’t work. Several are linked to the same page. 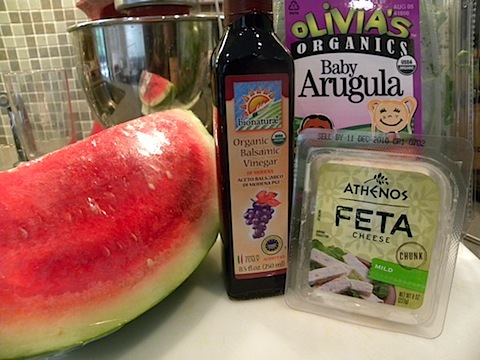 you had me at “watermelon and balsamic” but now with FETA? you spoil me. 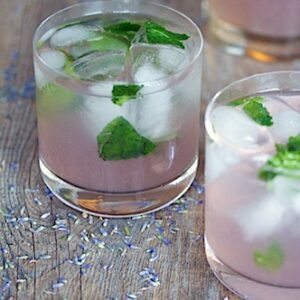 delish. This looks amazing! Exactly like Vlora – excellent presentation. ðŸ˜‰ Great job with Feta Month, I really enjoyed reading all of your recipes and will hopefully be trying some out – thanks! I’ve been seeing the watermelon and feta around and I think it might be a cool tasting combination. 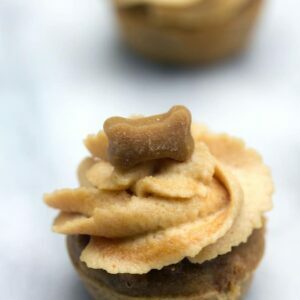 A great hot weather snack. 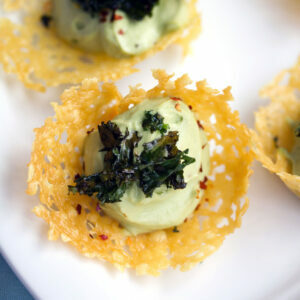 Looks like the perfect app to serve at a dinner party – yum! i LOVE the watermelon + feta squares at vlora. must do this asap!